The Best Golf Rangefinders of 2019 - Detailed reviews & Guide! Technology has come to the game of golf in a big way in recent years. Things like advanced club head designs and groundbreaking improvements in lightweight shafts, to name just a couple, have changed the game forever. Among those improvements is the way in which we figure out how far we are from the green. No longer do we need to spend wasteful time walking off yardages. High-tech has dramatically improved this aspect of the game, with the introduction of the laser rangefinder several years ago. In today’s article, we will take a look at this amazing technological advancement with a series of golf rangefinder reviews. But first, a little background. Many golfers today take for granted just how easy it is to determine EXACTLY how far they are from the pin from any spot on the course. Laser rangefinders, and other similar devices, have eliminated this previously time-consuming task with instantaneous answers regarding distance. There is no longer any guesswork involved. How did golfers calculate their distance to the hole before the introduction of laser rangefinders? Well, if we go way back in time, players like Ben Hogan and Sam Snead relied on their experience and a very keen eye to estimate how far they were from the pin. And, according to legend, they were uncanny in their ability to accurately determine their distances. Nonetheless, as good as they were at doing this, it was still a guess. It wasn’t long before golf courses started putting in yardage identifiers to help players. One method, for example, was to plant a small bush or to place a large rock just off the fairway at a distance 150 yards from the hole. Some courses put colored disks in the fairway at pre-determined yardage locations (e.g., a red marker at 100 yards out, a white marker at 150 yards out, a blue marker at 200 yards out). These course aids were a huge benefit to the golfer, as guesswork got even more limited. Eventually, a big step forward in providing accurate distance information took place when golf courses started imprinting the precise distances to the green on the various sprinkler heads scattered about the course. All you had to do was walk off the distance from one of these sprinkler heads to your ball, and voila!, you had your yardage. But even with these time-saving improvements, there still was a need to measure your ball’s distance from one of these markers, to determine your overall distance to the green. And with everyone in your group doing these measurements on every shot, the cumulative effect over an 18-hole round was to add a lot of time to the overall pace of play. The use of laser rangefinders eliminates all of that wasted time and speeds up play. In fact, a study conducted by Bushnell (one of the biggest names in golf rangefinders) and the National University Golf Academy, proved just how much of an impact these measuring devices have on the pace of play. In the study, a group of student golfers were brought in to participate in the test. Over the course of two days, the golfers played two rounds, with their pace of play being timed. One round was played with each golfer using a laser rangefinder, and one round without any type of electronic measuring device. The players with lower handicaps (6-13) played their rounds 30 minutes faster with the help of the rangefinders, while the higher handicap players completed their rounds 17 minutes faster using rangefinders. Laser rangefinders all work using the same basic concept. The rangefinder emits a Class 1 invisible, eye-safe laser beam at the push of a button. That beam bounces off a distant object and the rangefinder’s high-speed clock measures the total time it took from when the beam left the unit until it returns. Since they know how fast the beam travels (at the speed of light), the unit can simply use that time measurement to calculate the distance it traveled, and then it displays that distance to the user. The entire process is so fast that less than a second elapses between the time you press the button to generate a laser beam to the time the exact range to your target is displayed. Are there Alternatives to Laser Rangefinders? In addition to the rangefinders that calculate distance using laser technology, there is an alternative type of rangefinder, one that utilizes Global Positioning Systems (GPS) technology. GPS rangefinders work using a network of satellites to determine your exact location on the golf course and the distance you are from your target. The satellite network transmits signals to a GPS receiver (in this case, your rangefinder), and displays that information for use in proper club selection. In a way, oddly enough, U.S. President Bill Clinton can be thanked for the advent of satellite-based golf distance measuring devices. In 2000, he signed legislation authorizing the use of GPS data from American satellites for commercial purposes. Soon after that, we saw an explosion of applications for location-based systems using satellite information (e.g., GPS maps for driving directions, etc. ), which eventually led to the introduction of a device that used this same type of data for calculating yardages on a golf course. The laser rangefinder market is loaded with an impressive number of excellent products. All laser rangefinders offer the basic functionality of providing accurate yardage measurements. Where they differ is in the number and type of ancillary features, such as slope adjustment, magnification, etc. and, of course, in cost. As a potential user of one of these devices, you will need to determine which model best suits your needs, both in terms of features and price. We’ve tried to make your task a little easier by selecting what we feel are the premier laser rangefinders on the market, and by providing information about each that will aid you in your decision-making. In the reviews below, we look at the Top 10 rated laser rangefinders. And for those that are looking for less expensive models, we have also included reviews of the Top 3 “Budget” rangefinders. 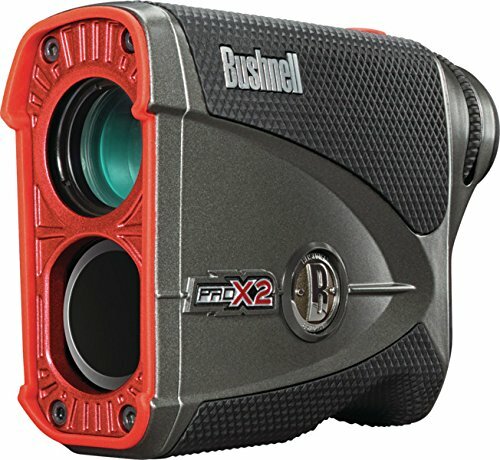 Many consider the Bushnell Pro X2 to be the best rangefinder in golf. It is one of the fastest models on the market today, acquiring pins reliably in fractions of seconds. It has a slope adjustment feature that can be easily switched on or off, making its use in competitive tournament play allowable. When the X2 locks in on its target, it produces a “jolt” vibration that confirms to the golfer that it has zeroed in on the right target. The bigger and brighter optics provide a crystal-clear display of the target and the surrounding area. Bushnell claims that their rangefinders are used by 97% of PGA Tour pros. Why it’s recommended: The Bushnell Pro X2 should be at, or very near, the top of everyone’s list. This is a premier rangefinder that has no real shortcomings. Bushnell has done a masterful job in creating a superior product. Background contrasted Crystal Clear Red OLED display, with auto or manual brightness levels. Nikon's LOCKED-ON 2 Technology, generation 2. Nikon’s latest rangefinder includes what it calls its “Hyper read” technology, which displays yardages in as fast as 0.3 seconds. The visuals have also been upgraded with its new internal OLED display, which includes a brightness-adjustment function to provide easy-to-read numbers in red on top of the target. “Locked-On” technology tells you when you’ve nailed the target without vibrating in your hands. Golfers who have occasionally struggled when using a rangefinder because of shaky hands will love the stabilizing function. It does have slope adjustment functionality, but that feature can be turned off with the simple push of a button to conform with USGA rules for competition. 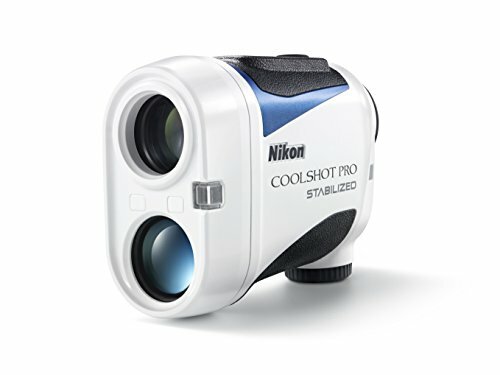 Why it’s recommended: The Nikon Coolshot Pro Stabilized is considered by many to be one of the top rangefinders on the market. It has every high-end feature that golfers could hope for, in a compact and lightweight design. The Bushnell Tour V4 is an outstanding option for those who want a simple but very effective product. To let you know that you have hit the flag, the Tour V4 will vibrate when you are locked on (Bushnell’s “Jolt” technology. There are two versions of the Tour V4, a Standard version and a Slope version. The benefit of having the slope function to see how much elevation affects yardages is well worthwhile. With this model, Bushnell decided to focus on emphasizing ease of use over loading in a lot of unnecessary features. Though there is only one button on the Tour V4, there are four modes: yards with and without slope, and meters with and without slope.The ability to turn off slope is important as it makes the Tour V4 tournament legal. Like the Pro X2 model, the Tour V4 is an extremely fast device that provides incredible accuracy. Distances are displayed to the tenth of a yard above the distance-adjusted number. The Tour V4 also has Bushnell’s signature JOLT Technology – a gentle shake when the laser locks onto the flag. 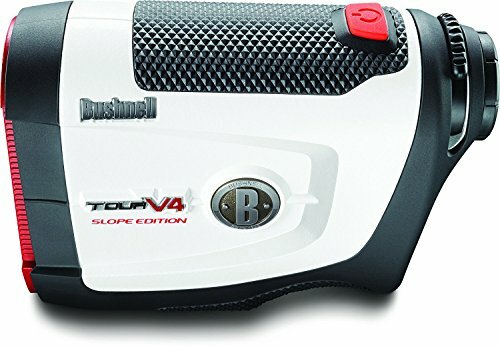 Why it’s recommended: The Bushnell Tour V4 Slope rangefinder is a very solid offering from the company with the most rangefinders on Tour. It’s small, extremely easy to use and, most importantly, very accurate. Can’t decide whether you want a laser-based or a GPS-based rangefinder? How about getting both? Bushnell has introduced a rangefinder that solves the problem of having to choose one or the other. 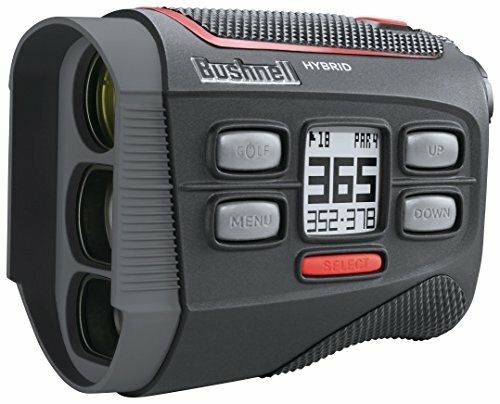 The Bushnell Hybrid is a unique rangefinder that offers both in the same unit. This new device combines Bushnell’s classic JOLT technology of their laser rangefinders with the extensive insight of a GPS device. The result is a two-in-one golf aid that gives you the best of both worlds. The Hybrid Laser/GPS rangefinder gives you more than the distance to the pin. You also get yardages for the front, back, and center of the green. If you’ve ever misjudged the depth of the green and over-shot into the bunker on the other side, you know how valuable this information can be. Furthermore, the Hybrid Laser/GPS rangefinder can provide these yardages for you on almost any golf course you might set foot on. The device comes pre-loaded with over 36,000 golf courses in more than 30 countries. Why it’s recommended: With the Bushnell Hybrid Laser/GPS rangefinder, you get the familiar functionality of a standard laser rangefinder with the advanced technology of a GPS. The Precision Pro NX7 Pro laser rangefinder is a top tier laser rangefinder at a third tier price. This is one of the best value purchases you will find in a laser rangefinder. Using the Mode button, you can toggle between yards and meters, and you can turn the slope adjustment on and off. It’s 25% smaller than the previous model it replaced, weighing only 5.4 ounces, and 30% faster. Distances are displayed to the tenth of a yard, and it measures targets as far away as 400 yards. The NX7 actually comes in two optional models, the standard NX7 and the slope adjustment model, the NX7 Pro. Clear optics, quick yardage readings, and precise technology make the Precision Pro NX7 Pro simple to use, even for those with shaky hands. To give you the confidence that you’ve locked in on the flag, its Pulse Vibration feature delivers a tactile confirmation. The NX7 Pro’s Adaptive Slope feature does the math for you on uphill and downhill shots. Its compact design and no-slip grip provide an excellent feel. Precision Pro also offers a customer care bundle to every buyer, which they call their Precision Care Package. It consists of: a 90-day money back guarantee, a guaranteed trade-in allowance, a 2-year warranty, free battery replacement service, and a series of “how to use your new product” videos. Why it’s recommended: The NX7 Pro has all the features you’d expect from a laser that’s twice as expensive, and it executes well on each one. 8-Second continuous measurement allows you to scan an area to find multiple distance measurements. Id technology displays slope-adjusted distance (horizontal distance height), enabling you to select the proper club for uphill or downhill shots. Nikon locked on technology provides an indicator when the closest target among a group is being measured, ensuring that the reading is the distance to the flagstick. Come with 1 Extra Battery. Nikon is well-known for their high-end optical technology and, with the Coolshot 80i VR, they have made a rangefinder that is well-built, reliable, and accurate, and also one that is full of valuable technology. 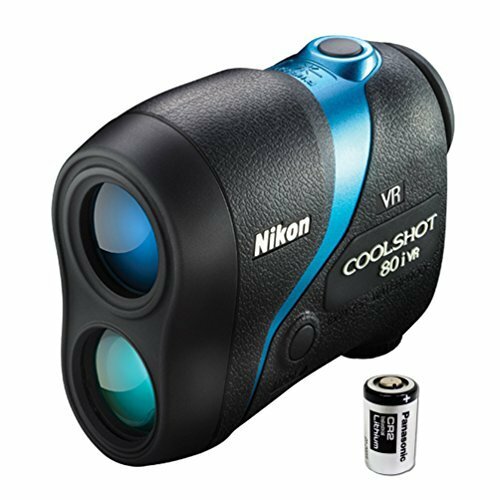 Why its recommended: The Nikon Coolshot 80i VR rangefinder is a simple and reliable device for all your distance needs. Nikon put all sorts of great technology into this compact rangefinder. 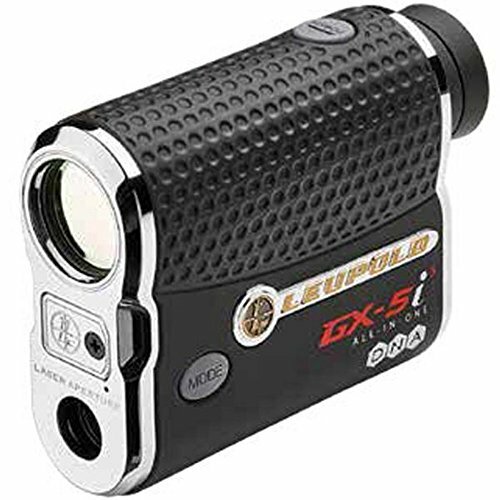 The Leupold GX-5i3 may be the most advanced laser rangefinder on the market. With this model, Leupold has decided to show how much technology it can pack into a few ounces. The “True Golf Range” feature enables golfers to compensate for the impact of slope on uphill and downhill shots. This feature can also be disabled to be permissible for tournament play use. The GX-5i3 is one of Leupold’s smallest rangefinders at 3.8 inches long, 3.0 inches in height, and 1.4 inches wide. And it weighs only 7.3 oz. One of the more impressive features of this unit is its amazing speed. It seems that as soon as you depress the button, the yardage is almost instantaneously displayed. Yardages are shown simply and accurately to the tenth of a yard. You can also level up and turn on the slope adjustment feature to let the GX-5i3 calculate how much the grade adds or subtracts from the shot. Why it’s recommended: This is not a laser rangefinder that you’d select if your goal is to save money. But it’s the one you’d buy if you want every feature under the sun. If that’s what you want, the Leupold GX-5i3 is the one. 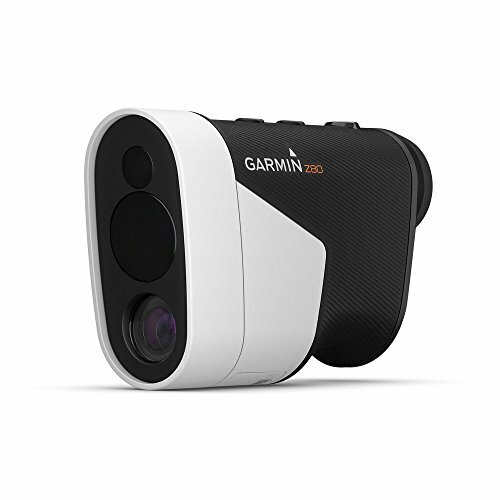 Like the Bushnell Hybrid, the Garmin Approach Z80 offers both laser and GPS capabilities in the same rangefinder. Unlike the Bushnell Hybrid, though, the Approach Z80 displays all of the information in the viewfinder, whereas the Bushnell unit displays it on the side of the device. It can provide distances up to 350 yards, and Garmin claims it is the most accurate laser, with accuracy to 10 inches. It is pre-loaded with over 41,000 courses worldwide. It has course flyover maps which appear on the screen. Another difference between the Z80 and Bushnell’s Hybrid is that this has an ‘all-in-one’ battery system which needs to be charged, while the Bushnell has a separate battery for the laser, meaning you only need to charge the GPS element of it. If you are one that wants all the bells and whistles, you won’t be disappointed in the Approach Z80. It is chock-full of features. Two of the unique, and very helpful, features of the Z80: The first is that it not only displays the standard distances (front, middle and back of the green), but it gives you a yardage suggestion for your tee shot. I’m sure you can think of many situations (like hitting on a dogleg hole, or when hitting a “blind” shot) where that would be very nice to have. The other helpful addition by Garmin is the ability to program in the distance of your average drive. Once set, the Z80 will show you a yellow arc on the hole overview within the viewfinder. This arc represents the distance of your drive and will help in your course management. Why it’s recommended: Golfers who are torn between choosing a GPS or a laser rangefinder, now have everything packed into one device. The Approach Z80 isn’t cheap, but if you love your technology and like to get lots of information on the course, the Z80 could be your solution. The most noticeable feature of the Nikon Coolshot 20 rangefinder is its diminutive size. This is one of the smallest lasers on the market, which gives it an advantage over other lasers because it can easily be slipped into a trouser or jacket pocket between shots so you don’t have to keep reaching into your bag. You will barely notice that it is there due to its extreme light weight. Although the Coolshot 20 doesn’t have as many features as some of the more expensive units – essentially it is a point-and-click device — it provides extremely accurate yardage measurements on a crystal clear display. If you are the type of golfer who only asks your rangefinder how far it is to the pin, the Coolshot 20 will provide the answer very effectively. Note: For those that like the Slope Adjustment feature, there is a model of the Coolshot 20 that includes that, called the Coolshot 20i. 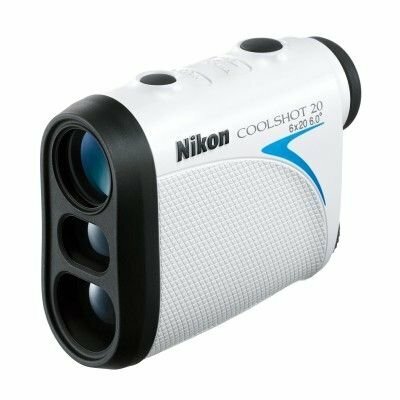 Why it’s recommended: Overall, the Nikon Coolshot 20 is a great value for the money, and it comes from one of the leading names in the rangefinder business. It also has one of the most compact footprints of any rangefinder on the market. 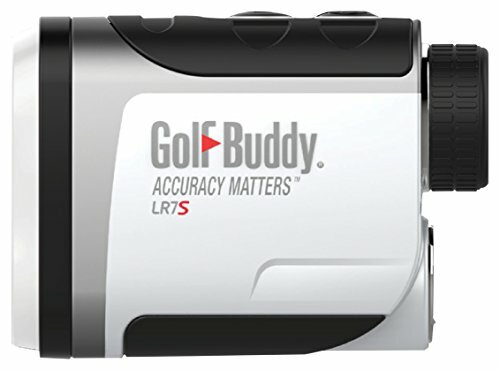 New to the Golf Buddy rangefinder product line is the Golf Buddy LR7S. It features all the same characteristics as the Golf Buddy LR7, but with the added benefit of a Slope feature providing slope-adjusted distances for uphill and downhill shots. It offers 4 separate modes: Standard mode, Scan mode, Pin mode, and Pin Finder. The LR7S isn’t listed among our top budget models, although it could be. It is priced very attractively compared to the high-end models, but offers many of the same features. 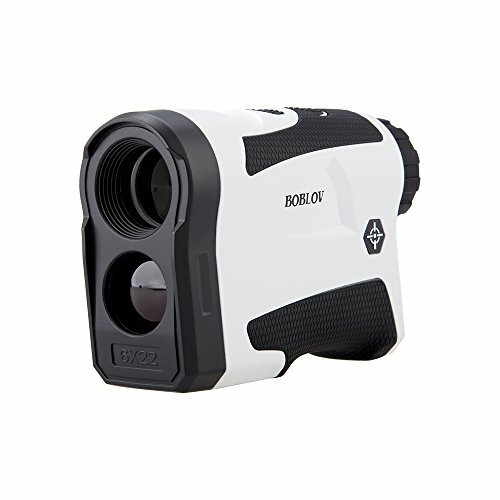 Why it’s recommended: The Golf Buddy LR7S is a solid performer that is one of the best “value for the money” rangefinders on the market. ACCURATE DISTANCES: the Nexus is better at measuring to the flag than you are at guessing. The 1-yard accuracy gives you the confidence to pick the correct club. USER FRIENDLY: our technology makes the Nexus simple to use even for golfers with shaky hands. ADDITIONAL FEATURES: water-resistant design, accurate to 1 yard, 400-yard range, 6X magnification, 1/10-yard measurements, yards and meters measurements, tournament legal. To put it briefly, the Precision Pro Nexus provides really excellent performance at a budget price. This is not a rangefinder loaded with lots of extras that many golfers simply don’t need. There are only two buttons on the Nexus: one for Power and the other to select the Mode. To get your yardage, push the Power button to turn it on, then push it again for the distance. The Mode button toggles the Target Lock function on and off, and the status is clearly indicated by a flag in the lower left corner of the display. Holding the Mode button switches you from yards to meters. This model does not provide adjustments for slope, but by omitting features like this, Precision Pro is keeping your budget in mind. If you’re interested in just the basics, this is one that performs them exceedingly well. 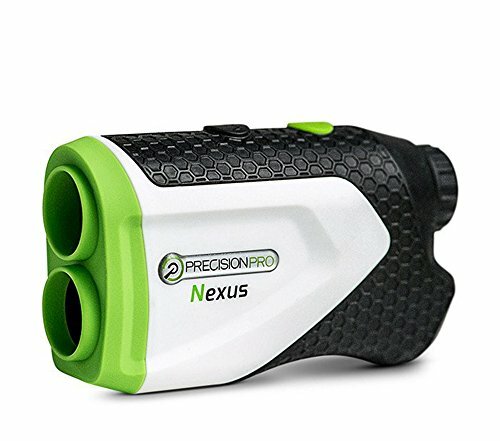 Why it’s recommended: The Precision Pro Nexus should be a top choice for buyers who are looking to save some money on their rangefinder purchase, and those who accept the fact that a unit costing less than $200 may lack some of the features of the ones priced at more than twice that. 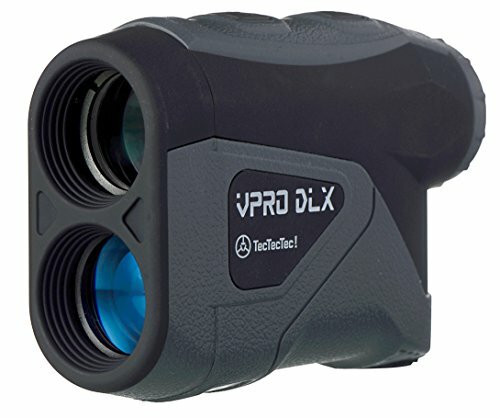 The TecTecTec VPRODLX Golf Rangefinder is another example of an excellent laser rangefinder that doesn’t break the bank. This compact unit performs very well, with some impressive features that you might not expect in such a wallet-friendly product. It provides measurements out to 600 yards and is accurate to +/- 1 yard. It has a multilayered optical lens that gives you all the data you’ll need in a bright, crystal-clear display. And it fits comfortably in your product. Also comes in a slope-adjustment version. 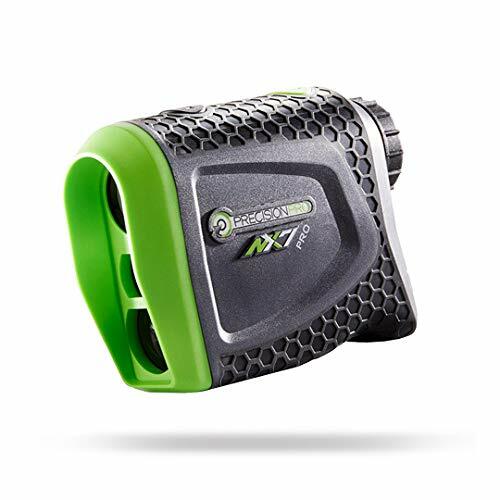 Why it’s recommended: The TecTecTec VPRODLX Golf Rangefinder is a budget friendly rangefinder that has all the right stuff. For the sub-$200 market, this is a sure winner. Vibration on/off function: When the flag distance is locked, the machine will vibrate automatically,if you don't need this function, you can turn it off as your need. Battery USB Charging:Different from others with External removable battery,this one use Built-in rechargeable battery for device,No worry to change battery of device.when you use USB to charge fully,it can scan 30,000 times. BobLov is a name that you may not be familiar with. The reason for that is that they don’t spend a lot on advertising. What they lack in advertising, though, they make up for with a quality product at a remarkable price. This one sets the mark for lowest cost rangefinder in our list of best “budget” models…this one will set you back less than $100! The BobLov 650-yard budget golf laser rangefinder certainly doesn’t look or feel budget. It has a clean black and white finish that looks sharp and stylish. Why it’s recommended: We are aware that many golfers will be looking for an entry-level rangefinder that is bargain priced, and yet provides the most important features that you need in a laser rangefinder. The BobLov laser device is that rangefinder. The single biggest reason many golfers prefer a laser rangefinder isaccuracy. Every major laser rangefinder on the market is accurate to within a yard, and some promise accuracy to the half or tenth of a yard. Another plus for lasers is that theycan be used anywhere. 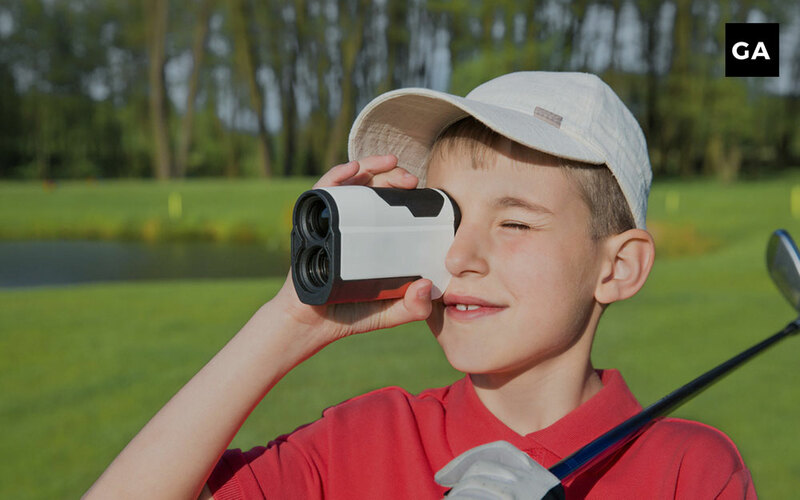 You can use a laser rangefinder at every course on the planet without worrying about downloading the course in advance. Lasers are also great on the driving range – you can verify the exact distance to every target flag on the range. The biggest hurdle for laser rangefinders is cost. Even the most inexpensive laser rangefinder costs around several hundred dollars (although we will highlight later a few budget models that sell for much less). While a good laser should last for years, some people may have a problem with laying out that kind of cash up front. Another issue that some people have with lasers ispace of play. Where a GPS-based device will give you the yardages as soon as you get to your ball, a laser rangefinder requires you to take it out and aim it at the flag to get your number. As we’ve previously discussed, however, using a laser rangefinder is still far faster than not using any type of measuring device at all. Finally, a laser rangefinder canonly give you yardages to things that you can see and “hit” with the laser. A laser is best for getting the distance to the pin, but it can’t reliably tell you the distance to the front, back, or middle of the green. The biggest thing in favor of GPS is thecost. There are dozens of golf GPS apps available for any smart phone, and many of them are free. Standalone GPS units can cost as little as $100. While there are certainly more expensive, full-featured options, the barrier to entry for GPS is practically nonexistent. Another thing that makes GPS attractive is thewide array of forms that it takes. You can get your yardages on a special-purpose golf GPS device, but you can also get them as apps on your phone, on a watch, and even on a hat clip. This allows you to use whatever is fastest and most convenient for you. Finally, a full-featured GPSprovides the most information. This can be very important, especially when you’re playing a course for the first time. A GPS will not only give you the distance to bunkers and water, it will show you the hazards that you can’t see. It also gives you information about the size and shape of the green which can be crucial for good course management. The single biggest disadvantage that GPS devices have compared to laser rangefinders is accuracy. Accuracy is the GPS device’s Achilles heel and also the most frequent complaint heard by its users. GPS devices are also unable to give exact yardages to the flag. The best you can get are readings to the front of the green, the center of the green, and the back of the green. Laser rangefinders are simply more accurate and versatile in measuring precise distances. Golf GPS devices will certainly give a pretty close estimate of the distance, but lasers are EXACT. Complicating the accuracy issues of GPS devices is the fact that outside conditions can have an impact on the ability of the device to obtain accurate readings from the satellites. Certain conditions, such as dense tree cover, or tall buildings, can impede the signal and provide inaccurate readings. For the GPS device to do its job properly, it is necessary to download the specific course that you intend to play onto the GPS rangefinder. They obviously cannot be used at all if the course you intend to play is not in its “inventory.” Many higher-end units come pre-loaded with a large number of courses, but for courses not pre-loaded, you will need to download it, in a process similar to downloading an app to an iPhone. Most laser rangefinders offer two modes. The first allows the user to pinpoint the distance to any target (pin, lip of bunker, tree, etc.) while continuously scanning across different targets on the course. The second is a more specialized mode that helps the user find the closest target (usually a flagstick) within a line of sight and essentially ignore the objects behind it. Some devices offer additional information such as the average slope from the user to the target, along with the distance the user should actually “play,” recognizing that shots to an uphill target play longer than the line-of-sight distance, and that shots to a downhill target play shorter. Keep in mind, though, that laser rangefinders with the slope adjustment feature are not legal in sanctioned tournament play. So, if you play tournament golf, you must first disable the slope adjustment feature. There are usually two methods for obtaining a distance reading. One method is to press and hold a button while focusing on your specific target. The other is to point the rangefinder at the target, and then release the button. Some better laser rangefinders have a feature called Fog Mode. Not every round is played under bright, sunny skies. For those days when there is fog or heavy mist, these devices will still perform accurately. More and more golf courses around the world are utilizing flag sticks that have an in-built prism. The purpose of the prism is to enable laser rangefinders to “lock on” more quickly, and when they do, they will emit an audible tone or vibration. Having gotten that tone or vibration will give the user the confidence that the device has provided 100% accurate information. Some laser devices offer a “club selector” feature, which allows you to program into the device your average distances that you hit each club. Armed with that information, the rangefinder can then make a specific club recommendation when it provides you with the measured yardage. Some laser rangefinders utilize “digital signal processing.” This enables some rangefinders to pick up less digital noise than traditional rangefinders to deliver a more precise distance to the target. More accurate ranging = more accurate shot-making. Image stabilization is technology found in several of the better rangefinders. The increased stability helps golfers with even moderately shaky hands to acquire the target faster and with more confidence. Dual laser/GPS technology – There are some hybrid rangefinder models that employ both laser technology and GPS capabilities. Magnification – Many high-end rangefinders feature magnification technology, in which a zoom capability of 5x or 6x gives you a clear view of your target from far distances and allows you to better lock the crosshairs on the flag stick or other target. There are many great choices when it comes to selecting the right laser rangefinder. Ultimately, it will come down to your personal preferences, particularly as they pertain to the price of the product, how the product performs, and the features that you think are important. Hopefully, this article has made your search a little easier. Golf rangefinders are an amazing tool to have in the golf bag to reduce you strokes on the course. Accurately measuring the distance to the flagstick greatly improves your chance of selecting the right club for the hit.